Some of Russia’s most beautiful medieval frescoes are preserved in a small monastic ensemble on the shores of Lake Borodava. 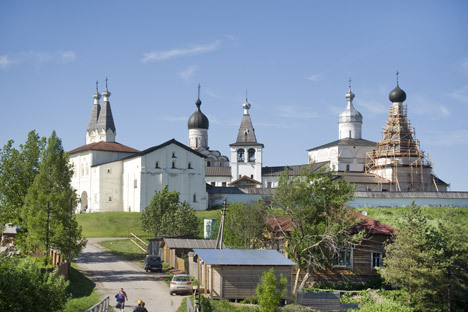 Ferapontov Monastery, which marks its 626th anniversary this summer, is among a small group of Russian cultural sites on the UNESCO World Heritage List. This honor was bestowed on the monastery primarily as a recognition of the early 16th-century frescoes in the monastery's Cathedral of the Nativity of the Virgin. These paintings are considered among the greatest examples of medieval Russian art. Ferapontovo village is located about 12 miles from the Sheksna River, a link in the well-traveled river route between Moscow and St. Petersburg. Although not included in tightly scheduled summer cruises, the monastery and its luminous frescoes are readily accessible to art lovers from throughout the world. The monastery was established in 1398 on the shores of the small Lake Borodava. Its founder, Ferapont (1337-1426), was a monk of noble birth from Moscow's Simonov Monastery. In the mid-1390s he and another monk, Kirill, set forth on a monastic quest for solitude in the vast forests of the north. By 1397, Kirill had established the Dormition Monastery on Siverskoye Lake near the Sheksna River (now the town of Kirillov). Within a year, Ferapont left to form his own spiritual retreat a short distance to the east. He was canonized in the 16th century, and the northern monastery that he founded came to be known as Ferapontov in his honor. The monastery is situated on a bluff with a sweeping vista of Lake Borodava. Its entrance passes through a gate picturesquely crowned with two small churches built in 1649, the Epiphany and St. Ferapont. To get to Ferapontovo take the train from Moscow to Vologda (Yaroslavsky railway station; travel time 8-9 hours), take the locus bus from Vologda to the the town of Kirillov and then take the local bus from Kirillov to Ferapontovo (departure 8:30 a.m., 2:00 p.m. every Tuesday and Thursday, travel time 30 min). The central monastic church, dedicated to the Nativity of the Virgin and originally a log structure, was rebuilt in brick in 1490 under the guidance of Abbot (Hegumen) Ioasaf. The upper walls and cupola of the structure were modified as early as the 16th century, with additional changes during the 18th century. The impetus for the remarkable frescoes also came from Ioasaf, who was a spiritual adviser to Grand Prince Ivan III and a member of the princely Obolensky family. With such connections, he was able to draw upon the services of the renowned artist Dionisy, who had completed commissions for frescoes and icons from the Muscovite court. In 1502, Dionisy and his sons Feodosy and Vladimir journeyed to Ferapontov. They were able to paint the entire interior that summer. Such work was possible only in the summer months because of the damp climate. The remote location and small size of Ferapontov Monastery spared the cathedral walls from the repaintings typical of more prominent medieval churches. Despite structural damage and periods of political turbulence, the frescoes have survived with only limited losses, allowing an unrivaled insight into the monumental creativity of Dionisy. The west (main) entrance consists of a simple perspective portal flanked by frescoes devoted to the Nativity of the Virgin. Archangels Michael and Gabriel guard the portal. Although partially damaged by the construction of a porch and gallery in the 16th century, the entrance frescoes thereby gained protection from the severe climate. Their surfaces still retain a rich palette of colors. On entering the Church of the Nativity of the Virgin, visitors are greeted by a compact space whose walls are completely painted. The volume is defined by four piers, which support a single cylinder (or drum) and cupola. Iron tie rods connect the upper parts of the main structural elements. On a bright afternoon, the interior is suffused with color. The Ferapontov paintings are radiant in their warmth and the expressiveness of their figures. Legend has it that Dionisy derived the pigments for his water-based paints from stones found at the nearby Lake Borodava. It is more likely that he brought from Moscow materials of the highest quality, supported by the largesse of Ioasaf and perhaps the court itself. As befits the dedication of this church, most of the frescoes are devoted to Mary. The great Akathistos cycle of liturgical hymns to the Virgin is comprehensively depicted and includes miracles and other events in her life. The entire fresco ensemble can be seen as a work in praise of Mary. There are also images of archangels, saints, and church fathers on the piers and arches. The lower tier of the north and south walls includes a depiction of the Seven Ecumenical Councils, which affirmed the doctrine of the Trinity. Soaring above the interior, the dome contains the mysterious image of Christ Pantocrator ("Ruler of all"), a feature typical of Russian Orthodox churches. Archangels appear in the cylinder beneath the dome, together with medallions depicting patriarchs from the Book of Genesis. Images of the four evangelists are portrayed on the triangular pendentives at the base of the cylinder. This central space is surrounded by a constellation of medallions with saints. In the east is the most sacred part of the structure, the apse. The main bay, which contained the altar, is centered on a vibrant fresco of the enthroned Virgin Mary with the infant Jesus seated on her lap. The north (left) bay contained the prothesis, where the sacraments were blessed. At its top is John the Baptist, Angel in the Wilderness. The south bay contained the diakonikon, with the priests' vestments. It culminates in the intent gaze of St. Nicholas. The exit from the interior of the church is dominated by the west wall with its partially preserved fresco of the "Last Judgment." The central elements, including Christ Enthroned, were lost to ill-conceived structural changes in the 18th century. Despite this loss, the preservation of these sublime frescoes must be considered one of the miracles of Russian art. In addition to the Nativity Cathedral, the monastic ensemble includes the refectory Church of the Annunciation (1530-31) and the Church of St. Martinian (1640), with its "tent" tower roof. The ensemble is linked on the west by a raised gallery with a 17th-century bell tower. One of the most appealing elements of Ferapontov Monastery is its natural setting, surrounded by lakes and forests that convey the lyrical beauty of the Russian north. However strict their ascetic devotion, the pioneering monks who came to this region had a keen aesthetic sense. A view of Lake Borodava from the monastery bluff convinces that the transcendent power of the Ferapontov frescoes is an extension of nature's art.